Wallcovering has turned this Master Bath into a warm inviting retreat. This vinyl pattern has a small weave texture and a little bit of gold color that adds an understated elegance! The look is timeless, and will go with anything the homeowners want to do to this room in the future. Being a vinyl, it is washable and will resist staining. Unfortunately the texture and gold in the pattern can not be seen in my pictures but none-the-less the room looks stunning! This entry was posted in Uncategorized on March 26, 2017 by Paperhanger. 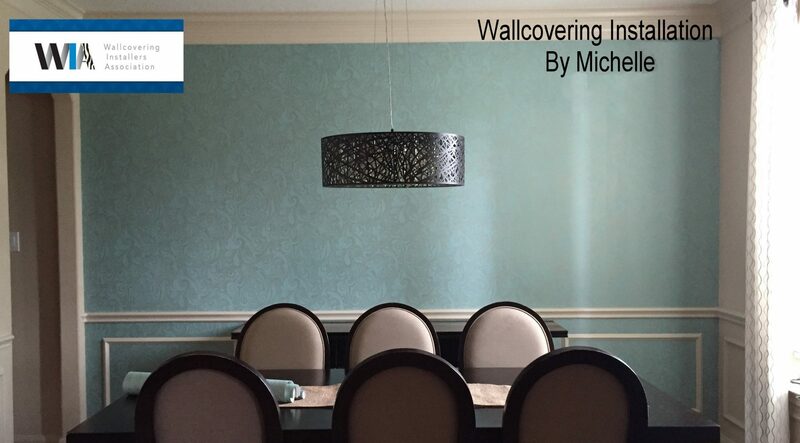 This kitchen and breakfast room went from frumpy to fabulous with only a change in wallcovering. At one point in time, the striped paper was dashing and trendy…but that was yesterday. Today, it has undergone a complete facelift; becoming an example of classic sophistication. The grasscloth-look, vinyl wallcovering, opens up the room making it appear less busy and larger. Isn’t it amazing what wallpaper can do? I love what I do for a living! This entry was posted in Kitchen, Wallpapering Jobs and tagged Home decor, Home remodel, Paperhanger in Cypress Texas, paperhangers in Houston Texas, Wallcovering Installation, Wallpaper, wallpaper kitchen on March 26, 2017 by Paperhanger.